We’re not just wanting to keep Christians happy and growing. We aren’t attempting to lure believers from other churches by having glitzier services and better programs. We’re starting with hard-core skeptics and trying to transform them into zealously committed disciples of Jesus. To be truthful, most churches aren’t actively engaged in that process. In fact, let’s get real honest about what happens in a lot of them. After they get out of seminary, pastors are assigned a little flock of sheep and given a pen to keep them in. They see their job primarily as keeping the existing sheep safely within that corral. So they feed them a little, they give them something to drink, they pat them on the head, and if the sheep get too close to the fence, they warn, “Get back! Get back!” And they encourage them to give birth to little lambs, because that’s the way the church grows. Is that cynical? OK. Maybe it is. But there’s also some truth in there. Those of us who started Willow Creek decided early on that we didn’t want to spend our lives just trying to keep sheep in a pen. Instead we wanted to do what Jesus told us in the Great Commission: “Therefore go and make disciples of all nations, baptizing them in the name of the Father and of the Son and of the Holy Spirit, and teaching them to obey everything I have commanded you” (Matthew 28:19–20). In other words, reach them and teach them. Find lambs who aren’t part of the flock and enfold them through what Christ has done. Then don’t just pat them on the head. Turn those grass-munchers into spiritual champions—fully devoted followers of Christ who unapologetically orient their entire lives around Him. That means we needed to pay attention to both parts of the Great Commission. Yes, we wanted to be a worshiping church, but that doesn’t fulfill the evangelistic imperative of Christ’s command. Sure, we wanted to reach seekers with the Gospel, but that wouldn’t achieve the second directive: to grow up believers in their faith. We needed to do both—and to do it according to the unique thumbprint that the Holy Spirit had in mind for us. So we developed a clear vision statement: We want to become a biblically functioning community. 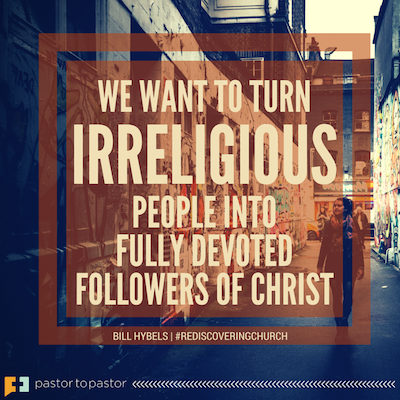 Then we summarized our mission in one sentence: We want to turn irreligious people into fully devoted followers of Christ. Anything less than that would not do justice to Jesus’ marching orders in the Great Commission. But what’s next? We needed an effective, God-honoring plan to accomplish that mission. The strategy we pursued intuitively for many years took shape when I wrote it down one day on a napkin in California. Every believer at Willow Creek sees it as their blueprint to accomplish our mission. We call it our seven-step strategy, and it’s part of our “thumbprint” as a church. That’s a summary of one church’s strategy to fulfill the Great Commission. We want our people to build friendships with Unchurched Harry and Mary, share their faith with them and explain what the cross of Christ is all about, and then invite them to a weekend service so we can do “team evangelism” together. Once Unchurched Harry and Mary have put their trust in Christ and become Believing Harry and Mary, we want them to learn to worship and participate in the sacrament of communion at New Community, to experience life change through deep and loving interaction in a small group, to uncover their spiritual gift and put it into play, and to honor the Lord through the way they manage their resources. What’s next? Harry and Mary build a relationship of integrity with Unchurched Larry and Sheri, and the whole process begins again. Our strategy isn’t a linear progression as much as it’s a cycle that repeats itself. 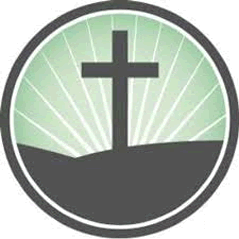 Other churches may take a different approach; they have a different thumbprint. And that’s fine. But every church needs to grapple with the question of how to follow the specific instructions that Jesus gave all of us in Matthew 28:19–20. It’s not enough to have a succinct mission statement engraved on a plaque and hung in the hallway where it can inspire everyone. While that’s a good step, it’s only wishful thinking unless there’s a concrete, Spirit-inspired game plan to turn it into reality. — by Lynne and Bill Hybels, adapted from their new book Rediscovering Church: The Story and Vision of Willow Creek Community Church. In the book you will find in-depth detail about how Willow Creek accomplishes the action plan summarized above. Learn about being the church from the story, successes, and struggles of Willow Creek. “That’s what this book is about,” write the authors: “being the church. It’s about people coming together to be Christ to each other in community. Interdependent. Vulnerable. 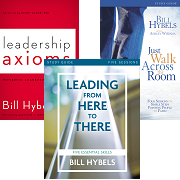 Giving.” You’ll understand the vision, values, and strategies that Willow Creek have implemented in their pursuit, and gain insights for strengthening your own church.